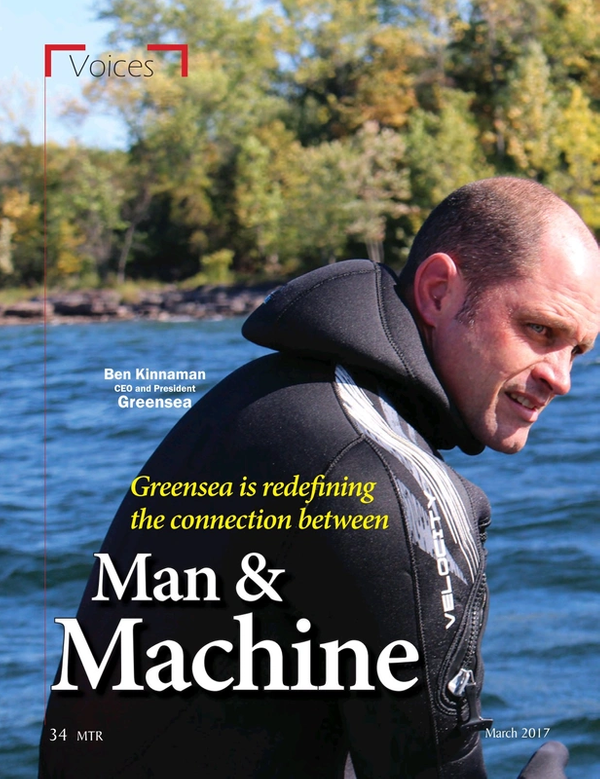 Ben Kinnaman and his Greensea Systems crew are on a mission to have its software backbone become the standard of subsea robotics and the marine industry, bringing a paradigm change in the relationship between man and machine. From his Richmond, Vermont headquarters, he explains. To kick things off, can you share with our readers how you came to found and own Greensea? I grew up on the Outer Banks of North Carolina; I grew up on the water. My first job was at 13 working on fishing boats and sailboats, and then I started diving. I went to school and earned an undergraduate degree in physics from Davidson College in North Carolina. I earned my undergrad in Physics – Computational Physics, and following graduation I went right offshore as a diver, working as a salvage diver for a number of years, moving to deep ocean salvage. How did you work help to shape your career? As a diver I was a contractor, so I worked for a lot of (the salvage companies). And then I worked for Phoenix International, (working) ROVs and AUVs on search and salvage, mostly deep ocean. I wrote my first computer program when I was eight, and combined with my background in physics and computers, I certainly had an interest in the technology behind (vehicle operation). I developed a particular interest in what held it all together, and I think, uniquely, from an operator’s perspective, how it was applied in the field to get the job done. So I started working on a concept for a software architecture for (vehicle) control and navigation. Considering the complexity of the machines working undersea, isn’t this already a standard? Our industry is unique in the robotics world, and really in the machine world, in that we are blissfully without standards. If you look through the subsea industry – and largely through the marine industry – standards are very hard to come by. There were a few standards that have been adopted in shipboard interfaces. But when we start moving to subsea, robotics, diving and submersibles, there really aren’t any standards. So that simple problem was really interesting to me. And when I was working offshore (around the year 2000) is when we started seeing a big step in (vehicle) technology. We started seeing this kind of ‘step’ function in technology coming into the field. AUVs were becoming viable (for commercial operations), but it was ‘step technology.’ As an operator, with each new capability we would get another black box, and we would take this black box and put a new computer in the rack and we would add a new monitor, and then we would integrate this new sensor onto this ROV. But it really wasn’t integrated, it was just bolted on. So at the time it was just more and more black boxes; it was a fascinating problem. So I started working on the concept of the software architecture that would knit all of that together, really focused on the operator’s relationship with this technology. Did you stay offshore while working through the problem? No, I left offshore and I moved into engineering. I went to graduate school at Johns Hopkins. I went to Hopkins to focus on control theory and robotics. My Master’s Degree is in Mechanical Engineering through Hopkins’ Robotics and Control program. Following your Masters, what was your next move? Starting in about 2008, we felt that that we had reached a maturity level with OPENSEA that that required us to start testing, it required us to start getting some blue water experience. From 2008 to about 2013 we took on several large projects a year. Prime contractor-type projects or science projects –big integration projects. So during this period, Greensea was largely characterized as an engineering services company. But our intent for OPENSEA all along was to develop a product for the offshore industry that could integrate these disparate technologies into a common operating platform, and ultimately, make the operator’s job a little bit easier and a lot more effective. And in 2013, we felt that we had reached a maturity level of OPENSEA that would enable us to start productizing this technology. So for the next couple years, we really listened to the community to figure out how to go to market with the technology. And what was the strategy from the outset? Marybeth Gilliam joined us at the end of 2014 to help me take this to market – to figure out the market entry for this technology and how we were going to be successful in the market with OPENSEA. Today Greensea is a provider of products and technologies based on OPENSEA in five sectors of the marine industry: manned and unmanned subsea, manned and unmanned surface, and diver systems. So in a nutshell, what is Greensea today? Greensea is a software company that develops technologies aimed at bettering the relationship between operators and their equipment. When you started the company 10 years ago was it just yourself? It was myself and another senior engineer for the first year or two, and then we brought on a technician. My wife was instrumental in making the company a company. Like so many startup stories, I was consumed writing OPENSEA, and my wife was holding the business together and making it happen. What was the main challenge as a start-up? That was a real differentiator between Greensea and everyone else, it remains our biggest differentiator and our biggest asset as a software company. So how did you settle on Richmond, Vermont, as the place for Greensea? Lifestyle and a place to raise a family. When we decided to start the company we had an opportunity to make some big decisions, and my wife was fortunate enough to have a career that would let her move. We knew we wanted to start a family, and we wanted an idyllic place for a family to raise kids. Vermont really impressed me because there was a growing technology environment, there was a growing small business tech environment. But there was an awful lot of support showing from state government and local government and local infrastructure for small business. So off we moved to Vermont. I know we addressed this briefly, but again what was the greatest challenge in the first few years? I think the greatest challenge was, and will continue to be the market. More specifically, the market adoption of a really advanced technology in an operating environment that had traditionally managed so many risks by avoiding technology. Just think about ROV industry; it is an incredibly high-risk environment. We’re working at depths greater than 10,000 ft. at a significant cost per day, so we have to manage risk. Traditionally, we (the industry) managed these risks by keeping things simple. But then we started having this mismatch of requirements and risk management. So on one hand we were managing things by keeping things simple; on the other hand we were having these growing set of operational requirements for positioning, quality of data, time onsite, cost mitigation and cost management among other things. So we started having all of these requirements that (could only be met by) injecting technology. So now we’re injecting technology with amazing new capabilities, but we weren’t addressing this fundamental premise to “keep it simple.” And that really was around how the operators work their vehicles. The operator – the point where the operators met the technology – we didn’t address that. How does Greensea aim to rectify the situation? Our company, this technology, represents a big change of how we see operators using vehicles and equipment offshore: it’s a total paradigm shift. The way forward is to elevate the operator; the way forward is to get the operator out from behind a joystick, out from behind a console flipping switches and to get the operator into the position of doing their job – to manage the task. So take mine countermeasures for example. We want to get these operators away from worrying about flying a vehicle, to focus on mitigating a mine and mitigating a risk offshore. But if they keep trying to manage this onslaught of ‘black boxes’ and bolt-on technologies, consuming their bandwidth and making the operator the integration point of all of these technologies, we are not going to move this industry forward. We are proposing a big paradigm shift in how operators use technology, how operators use vehicles offshore. And a big paradigm shift in an operator’s relationship with their systems. It is. The technology is tough, but that’s not the biggest challenge. The technology challenge is the kind of challenge that gets engineers out of bed every morning. But moving that technology effectively offshore, listening to the operators ultimately the technology and software is only as good as the user says it is. Listening to the operators and figuring out how to really address their operational issues is the hardest part. When you look at the company today versus when you started, how is it most the same and the most different? The company recently turned 10 years old and today we are at an inflection point. Our first 10 years were spent listening to operators and developing technology, creating products out of the OPENSEA framework. This is a small industry and we are proposing a big change in the way operators work with their equipment. We have one chance to get this right. So we’ve spent 10 years listening to operators and developing this technology, and today we have more than 700 systems in the field. We are at the point where we are growing the company into five segments of the marine industry: Manned and Unmanned Subsea; Manned and Unmanned Surface; and Diver Systems. (With our platform) an operator can buy a sensor from a manufacturer and plug it into his Greensea system. That is a huge concept in our industry, to provide a core system architecture that allows an operator to integrate any sensor, any device, to integrate new technologies, to integrate inertial navigation and positioning and autonomy. Our company today is much different than our company was 10 years ago in the sense that we are now really focused on commercial growth. And we are focused on integrating our products into the marine industry, whereas 10 years ago we were focused on technology development. How are we most the same? We are the same in the sense that when we founded the company, our number one goal was to listen to the operator. And that hasn’t changed at all. That’s tough. I think in a general sense, the realization of a pretty lofty idea 10 years ago and the development of OPENSEA. For 10 years we’ve stayed steadfastly true to our roadmap, and that is unique in growth companies. We have stayed as true and as narrow to our roadmap because I believed that there was a better way that operators could operate offshore, and operators could be using technology. We sketched out a roadmap, and it was through integration and it was through autonomy; using autonomy as a tool for the operators, not to replace the operators but to elevate the operators. From your perspective, put on a curve acceptance of the attitudes that you’re talking about. Where are we today? The doors have flung open and the clouds have parted, because the operators are asking for it. Why are the operators asking for it? How could it not be expected when I look at what I can do with my phone right here. I’m traveling to Florida next week, I can make my plane reservation, I can make my hotel reservation, I can book restaurants, and it’s all going to be integrated on my calendar. When I arrive it will remind me that I have reservations and ask if I want driving directions. That’s in my back pocket and everybody has that integration. So if that’s how we’re managing our day-to-day lives, how can it not be expected in our professional lives. So how is your company’s effort a means to this end? It is easy as engineers and technologists to get caught up in the “flashy” portions of OPENSEA – the vehicle control and the inertial navigation and the sonar integration and the target tracking and the feature-based navigation. But at the end of the day, the fabric of OPENSEA is data fusion. An operator today can put a Teledyne Seabotix vehicle in the water and fly it around and see something of interest on the sonar, double click on it, and then all of their control and navigation is with respect to whatever they clicked on. Is there one particular project – that you can talk about – in your mind that stands out that best illustrates the concept which you seek to deliver to this market in whole? I think the integration of this technology in both inspection and observation class vehicles and diver systems is probably the clearest, best examples of such a huge benefit and really recognizing the value of this technology. To date, I think the clearest and best, most concise example of realizing this goal and the potential is the diver nav system, the diver propulsion system that we do with STIDD Systems. (See related story pg. 43). When we have a conversation on the 20th anniversary of Greensea, where do you envision this company will be? Ten years from now, OPENSEA will be the standard operating platform of the marine industry. OPENSEA will be the architecture behind, certainly marine robotics, and I would say in a larger context, the architecture that operators go to for work offshore, and in the marine environment. We are certainly growing aggressively right now, but we’re preserving our culture, preserving what makes Greensea unique. So I think 10 years from now, our conversation will be quite similar: it will feel the same at Greensea, it will kind of look the same at Greensea; but you will see a lot more Greensea when you travel around the world. Ben Kinnaman, founder of Greensea, speaks passionately regarding the corporate culture he and his team have built, and aim to maintain, as the company expands. Through all of the high tech solutions the company delivers with its software backbone as it seeks to enhance the relationship between man and machine, perhaps no other element better embodies the Greensea philosophy than the ubiquitous Greensea workshirts worn by its entire crew. Kinnaman explains their significance. “When I started the company, literally the first day when I left the attorney’s office after signing the incorporation paperwork, I got home and I put on this workshirt. The reason I did it: I wanted to make sure that as Greensea developed this technology, when all of these super-smart engineers around here get themselves dressed in the morning and look at each other, that they’re seeing their end user – that they’re seeing some guy in the field wearing a uniform – like our armed service vendors and like our defense customers. We are wearing a work shirt for our commercial customers and our commercial end users. “And I wanted to make sure that every single day there was a direct relationship between the technology that we are developing, our engineers and their end users. Kinnaman thinks big, delivering solutions that enhance the man/machine relationship, and allowing the human specialist – whether that specialist is a scientist, commercial manager or combat diver – to do their job more efficiently. Greensea’s work with Stidd Systems on its Diver Propulsion Device (DPD) is a perfect example. Kinnaman said the engineering challenge is the relationship – how the operator is to use the tools that are behind the scenes – the inertial navigation systems, the autopilots, the mission planning systems and the sonar interfaces. The interface that delivers the operator’s requirements is really the hard part, and that’s the relationship. For the DPD Greensea has a number of deliverables according to Kinnaman. “STIDD builds the Diver Propulsion Device, and there is an element to the DPD called the R-NAV 2, a navigation system, a computer that plugs into the DPD. We build R-NAV 2 that runs our software. Inside of it there are four principle components, all of which are standard products for Greensea. We have an inertial navigation system, we have a mission planning system, we have autopilots and we have a sonar interface. And what fuses all of those together is this workspace, this unified operating environment which the operator uses, he’s got a small screen and he has two strain gauges under his thumb that he operates this system with while he flies. That’s the Greensea deliverable.